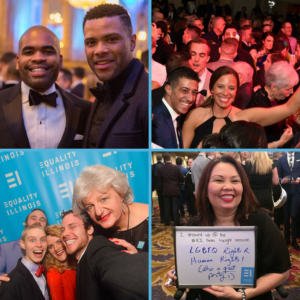 Thank you for being a part of the Equality Illinois family and joining us at the Equality Illinois 2017 Gala on February 4 at the Hilton Chicago. Your participation helped us raise the funds we need to educate and advocate on behalf of LGBTQ Illinoisans throughout the year. The links below will help you relive the experience through flipping through the gala program and looking at the pictures and videos. 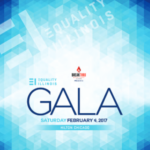 Learn about the sponsors, the honorees, the speakers, and the many contributors in the Equality Illinois 2017 Gala Program. DOWNLOAD YOUR OWN GALA MEMORIES Wonderful photographers donated their time and talent to shoot hundreds of pictures at the Equality Illinois 2017 Gala. View these galleries to relive the experience and see pictures of yourself and of your friends and VIPs enjoying the biggest formal LGBTQ party in the Midwest. Some of the galleries are free to download, while others charge a nominal fee. There are many other fun pictures posted on social media with the hashtag #eigala. Videos of the call to action by Equality Illinois CEO Brian C. Johnson, powerful testimonials from three people who benefited from the work of Equality Illinois, and the presentation of the awards to our honorees can also be seen on our YouTube channel.